There was so much to like about this place that I hardly know where to begin. 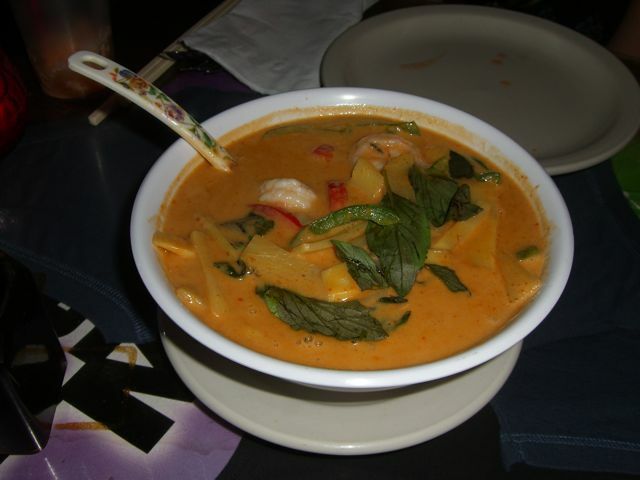 The last Thai place I reviewed was the perfect spot if you’re coming over the hill from Hollywood. This place is the place you go when you’re too drunk to drive over that hill. The restaurant is a pretty popular place and it’s very laid back. Our server was tending to a bunch of tables, but it didn’t seem like it. He was always checking up on us at the perfect time and made us feel very welcome in the space. The decor of the restaurant is random. There are tons of music posters on the walls alongside a paper mache deer head, a dragon that looks like it was made from a bear trap and these crazy hand painted lamps that no amount of writing can describe. In short, it’s just plain cool. We started off with some egg rolls as an appetizer. They were simply done, fresh and not greasy at all. They serve them with a sweet sauce and a spicy sauce that packs just enough heat so you know it’s Thai food. We made short work of them and by the time we were done, our waiter was back to take our dinner order. We shared three dishes for dinner. I got the red curry with shrimp, Jackie got the veggie pad thai and Alisa ordered chicken fried rice. I honestly don’t know how long it took for the food to come out because we were having a pretty good time, but it didn’t seem to take very long at all. My curry was not very spicy, but it did have a lot of flavor. It was pretty sweet and seemed heavy on the coconut, but the brown rice, that I got with it, cut the sweetness nicely. The shrimp were large and there were plenty of them. They were also cooked perfectly and didn’t have that rubbery texture that you get at some places. Jackie’s pad thai was excellent. My favorite part about it was, surprisingly, the tofu. 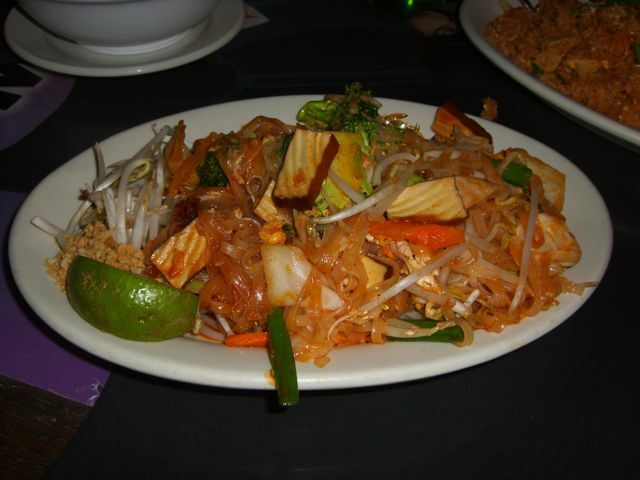 I find that tofu takes on the flavor of whatever you cook it in and since I like the taste of pad thai, the pad thai tofu added a whole dimension to the dish that I’d never thought possible. The noodles were just sticky enough and the veggies were crisp and delicious. The fried rice was great too. I mean, it’s hard to mess up fried rice, right? But this was different. I recently wrote about how I’m taking a sabbatical from Chinese food, so I wasn’t sure how I would feel about eating Chinese in a Thai restaurant. 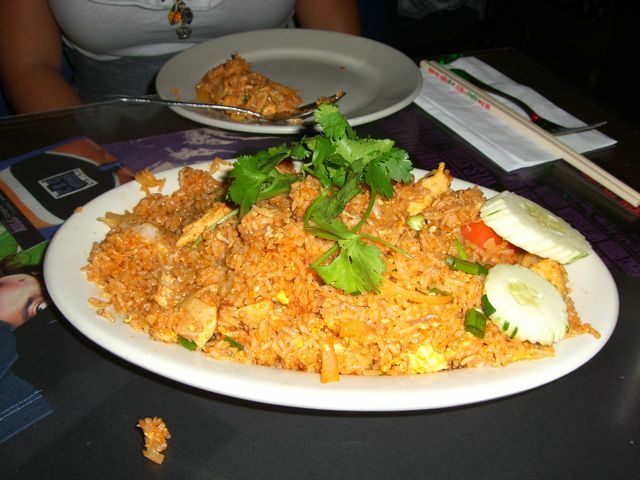 As it turns out, they add some of the Thai spices to the rice to give it a completely different taste. It ended up being better than any fried rice I’ve reviewed for the site and I also really appreciated the fact that the chicken was high quality and very tender. Ultimately, what made this place great was the fact that I was with good people. In fact, most of my favorite posts are the ones where I get to eat with friends. 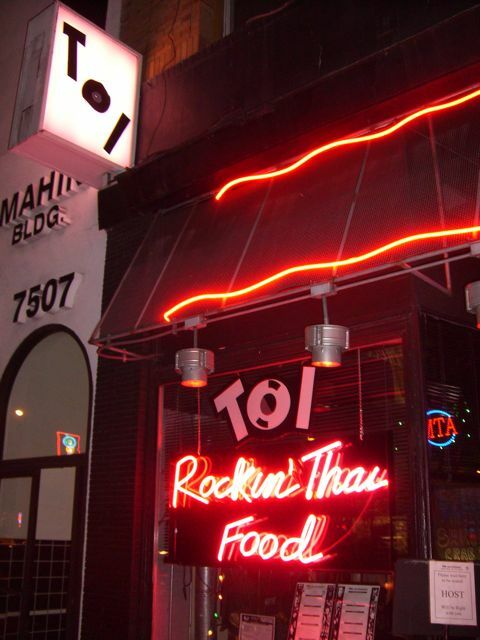 (Father’s Office, Mama Rita’s, My Fav Taco Truck, the list goes on and on…) Toi is the kind of place where you can sit and talk with friends, relax and enjoy a simple meal for a reasonable price. Most dishes are around $9 and we took home enough food for two people to have lunch tomorrow. If you do happen to go alone, don’t worry. Just looking at all of the posters and art on the walls is entertainment enough. If you’re the adventurous type, you can even take a stroll to the restrooms, where not only is graffiti allowed, it’s encouraged. They don’t just want you to experience Toi, they want you to add to it. Pretty cool, if you ask me. 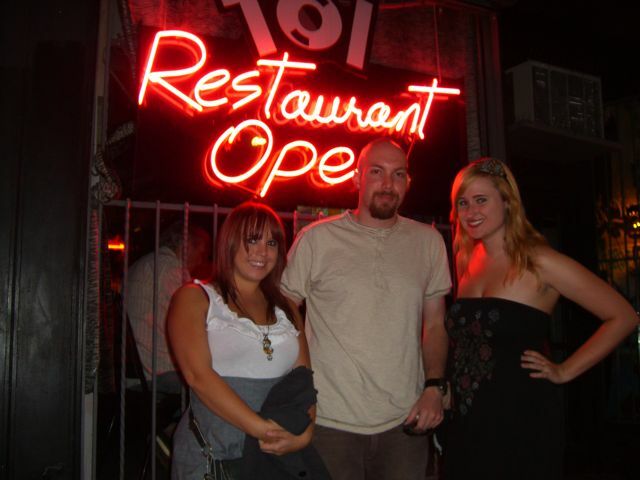 So next time you’re down in Hollywood, stop by and say hi to Mikey (He can usually be found on the corner of Hollywood and Vine, unless I think he can make me more $$$ elsewhere) and after that, go check out Toi on Sunset. I promise you won’t be disappointed.